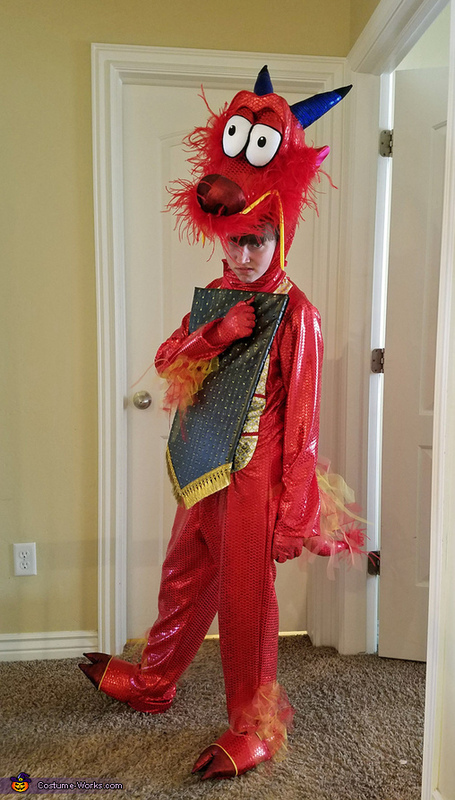 My daughter was Mushu, the dragon, in her school play Mulan. She is a very enthusiastic and funny actress. She decided to wear this costume to some Halloween activities this year and won two costume contests. This costume gets a lot of smiles! This costume was a little difficult to design. I mixed and redesigned patterns and made some of my own to come up with this look. I knew I was getting closer when everything I tried failed. She needed to have her face show for her lines, so I couldn’t make a full head mask. I was thinking about making the eyes out of Styrofoam balls but decided to try sewing them up instead which worked out for the appearance I was going for. The eyebrows were made out of foam covered in spandex and cording. The teeth are made from felt. The front of the face is lined in a feather trim. I made one of the ears to appear like a piece of it is missing like Mushu’s ear. The horns, nose, and ears are sewed onto the head. The front of the body has yellow scale spandex with cording in between which was very difficult to sew with a machine. I put fire on her sleeves and legs with tulle fabric strips. She could blow the tulle on her sleeves to make it look like she was making fire. Her hands are covered with gloves made out of spandex with spandex claws to match her feet claws, nose, and fins on the back. Her tail wags humorously back and forth as she walks. I bought some cheap canvas shoes and covered them in foam and fabric. I also made her a shield that ties around the neck for the war scenes in the play and bought a very small gong. She also has a little cricket. If I didn’t have to pull my hair out in designing this costume, it would have taken about a week. Cost – about $65.00. Awesome job l can't wait to make my version for my school play in May 2018. Great job. I'm working on making two for a middle school play in May. I hope mine look like yours. I have un question for the costum of Mushu How muse is it ?